The Cliff of Bandiagara (or Land of the Dogons) in Mali is an outstanding landscape and has earthen architecture that seems to defy the laws of nature and the passing of time. Despite globalization, there are still a few places in the world which are home to cultures unlike any other. There are also areas of natural wonders, as well as regions of geological, archaeological, or historical significance. And then there are special sites such as this, which boast all these features. The Cliff of Bandiagara, a beautiful and unique escarpment, is home to the Dogon people and culture, and because of its worldwide importance, was recognized as a World Heritage Site by UNESCO in 1989. It is truly one of the most impressive regions in Sub-Saharan Africa . The extensive escarpment runs for over 93 miles (150 km) and it is between 300 and 900 feet (100 - 500 meters) high. Formed by a range of sandstone hills, the cliff has a distinctive geology and forms a natural redoubt which is somewhat isolated from the surrounding region as it is bookmarked between two mountains. Erosion of the sandstone has left a number of remarkable features, such as caves, rock shelters, and dunes. Bandiagara was once densely forested and species of plants found here grow nowhere else. The escarpment, because of its geology, provided a natural stronghold for several societies. It was first inhabited by the Tellem, Stone Age hunters, at least 10,000 years ago. 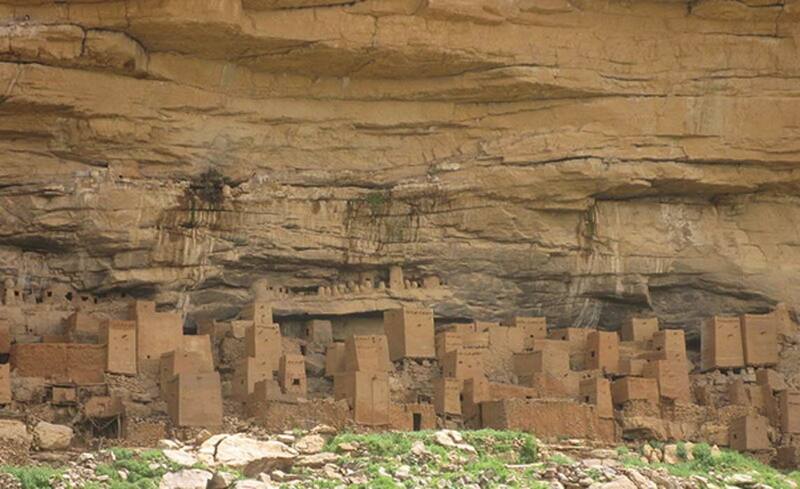 A cliff dwelling people, they inhabited the area for many centuries despite the hostility of the environment and were able to preserve their ancient lifestyle as they were protected from rivals by the long cliff of Bandiagara. Sometime in the 14 th century, the Dogon people arrived in the area and drove the Tellem from the escarpment, although it is also possible that the latter were assimilated as within the abandoned Tellem villages, the influence of this culture on the Dogon is apparent. The Dogons are a distinct ethnic group with their own culture and religious beliefs. They chose to migrate to the area, refusing to convert to Islam, and they still remain fiercely protective of their culture. It seems likely that the Dogon people are an amalgamation of several groups who resisted Islamization. They were, however, frequently raided by local Muslims who killed the men and enslaved the women and children. During the colonization of Mali by the French, the inhabitants of the escarpment were able to use caves and tunnels to avoid the Europeans and were able to preserve their way of life. Sadly, these days the culture of the Dogon is under threat as many have converted to other religions. The escarpment is rich in archaeological discoveries both from the Dogon and the earlier Tellem society. Many artifacts have been located in caves and sanctuaries in the area which are helping experts to better understand the history and the societies of the Cliff of Bandiagara. There are over 200 Dogon villages across the escarpment and each village has a democratically elected headman (Hogon), who is also their spiritual leader. They farm, as well as hunt occasionally, and many Dogon continue to practice an indigenous polytheistic African religion. Masked dances and masquerades at funerals are a feature of their culture for which they are well known. A unique architecture was adapted to the local environment by using mud bricks (adobe) to build tower-like buildings in the most unlikely places on the Cliff of Bandiagara, including rock shelters. Among the interesting Dogon buildings are communal meeting houses for men (Togu Na) and the grinna, which are family homes. These are two story building with separate areas for men and women. There are also two types of granaries - ‘male’ granaries with a pointed roof is where seeds are stored, and ‘female’ granaries (without points) are where the women of this society (who are economically independent from their husbands), store their personal belongings. Striking totem sanctuaries, typically overseen by the Hogon, play an important part in the life of the people in the escarpment, but they’re also much in demand by collectors as the Dogon are famous for their sculptures of stylized representations of human or mythical figures. The cliff is not far from the city of Bandiagara in western Mali. It is advisable to hire a guide with a car as the area is remote. Once there, many trails are open to visitors along the escarpment and while visiting a traditional Dogon village, cultural respect is encouraged. The increase in the number of visitors to the area in recent years has done wonders for tourism, but has sadly damaged the environment and this special cultural landscape. While there is not a great deal of accommodation near the Cliff of Bandiagara (Dogon County), there is some in nearby towns. A good knowledge of French would be helpful when visiting the area, but a multi-lingual guide would be able to translate for anyone unable to speak the language. The Dogon are a wonderful and unique culture. I have lived nearby and visited Dogon country. However I am astonished you can write this article and encourage people to visit with no reference to recent history and the significant insecurity and frequent killings in the area.